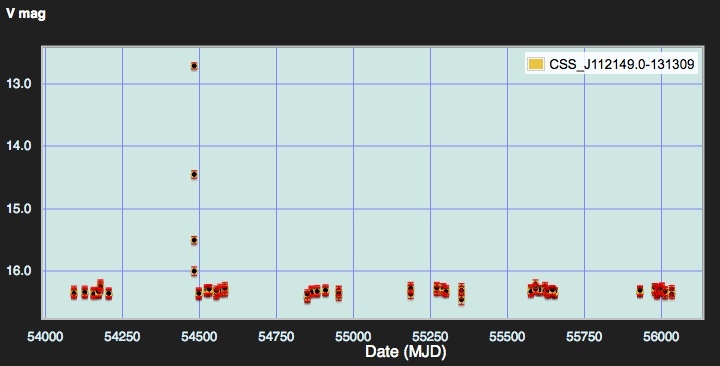 Welcome to the second data release from the Catalina Surveys Team. 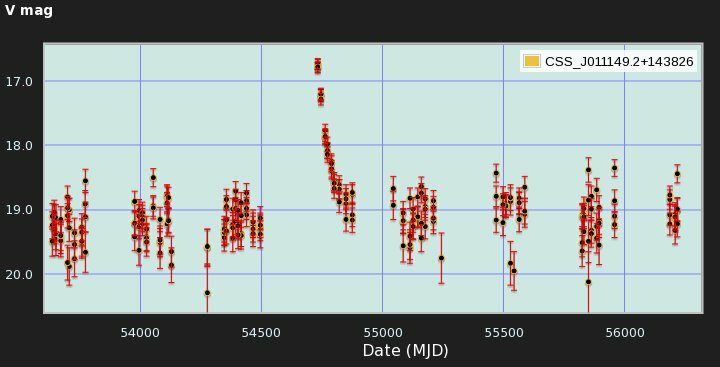 New (2018-06-27): Photometry for all 5540 CRTS-I transients discovered in CSS data. 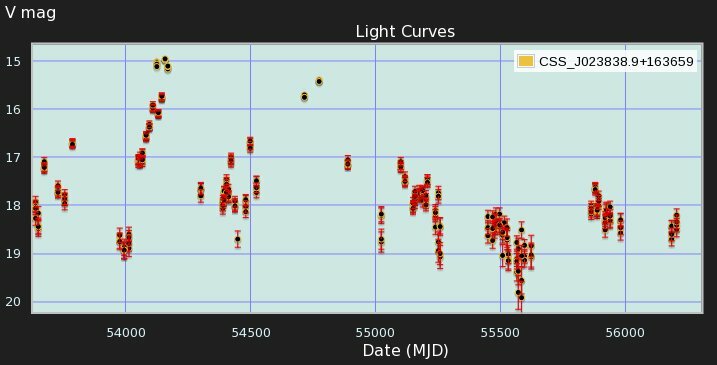 2017-11-15: Updated Catalina RR Lyrae Catalog (43,389 lightcurves). 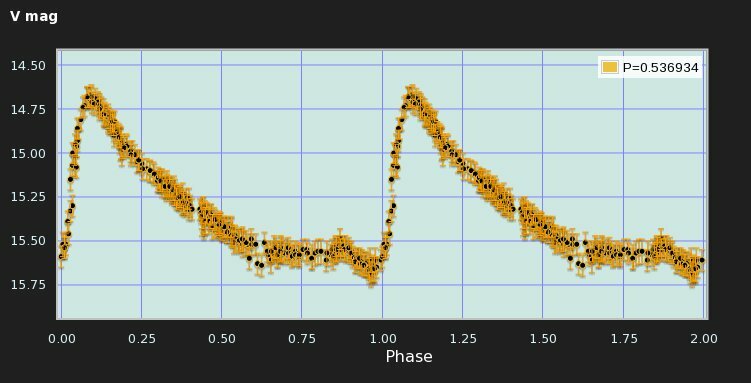 2017-05-24: Catalina Southern Periodic Variable Star Catalog. 2014: Catalina Northern Periodic Variable Star Catalog. Find out what's new about CSDR2. 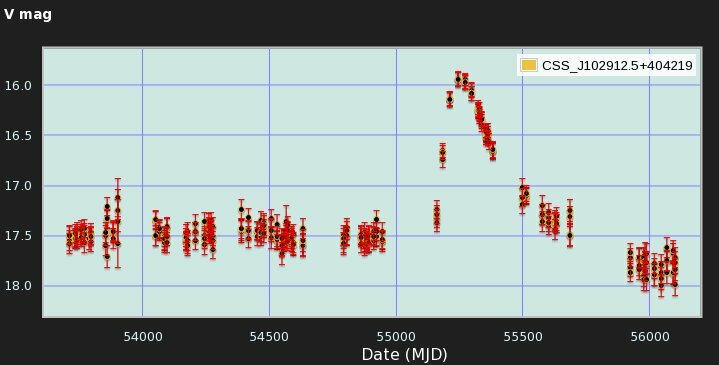 The CSS project involves searches for rapidly moving Near Earth Objects (NEOs), while CRTS searches for stationary optical transients (OTs). Both surveys work collaboratively to extract the maximum scientific return from data from three telescopes operated by CSS. In this same collaborative spirit we are now providing an open-access to all the archival photometry. An Aitoff projection of the sky region covered by this release in equatorial coordinates (centered at RA=0h). The colour key gives the number of epochs at each location (click for larger image). 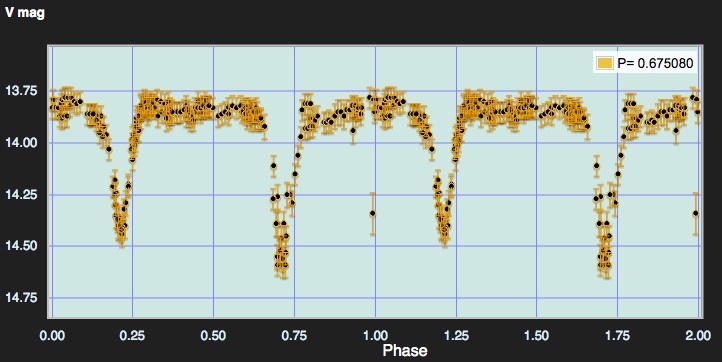 Here you will find the second public data release (CSDR2) from the Catalina Surveys that consists of all photometry from seven years of photometry taken with the the CSS telescopes. 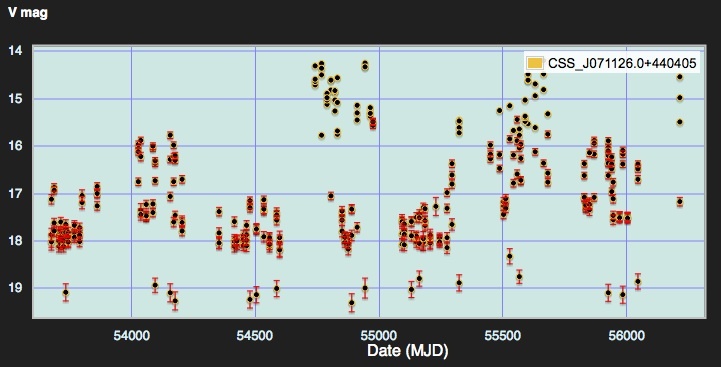 This data release encompasses the photometry for 500 million objects (~40 billion measurements) with V magnitudes between 11.5 and 21.5 from an area of 33,000 square degrees. 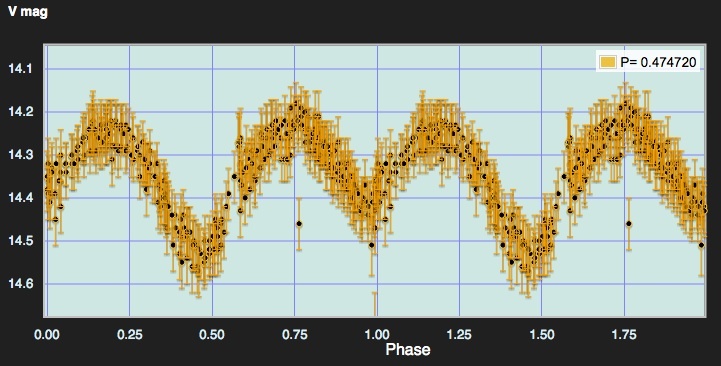 Catalina photometry covers objects in the range -75° < Dec < 70° and |b| > ~15° with the number of observation epochs at each location is as shown above (see FAQ). Catalina images will be available in the third data release. 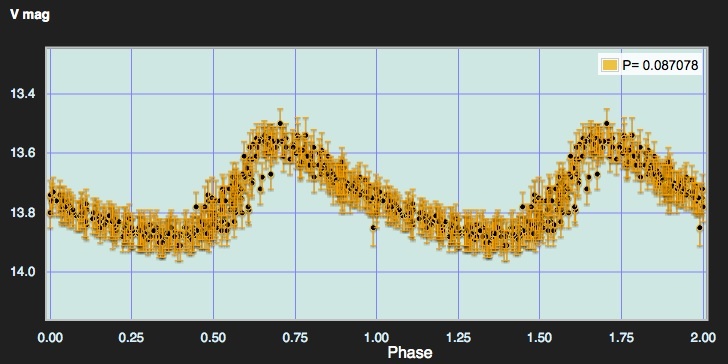 Search for photometry in a single location. 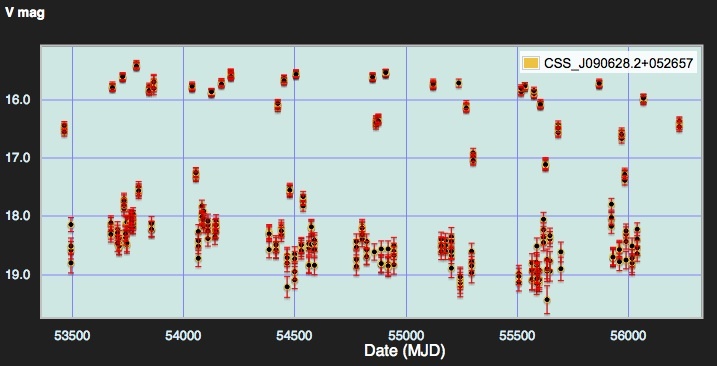 Search for photometry in multiple locations. Retrieve photometry by object name. Check image coverage by location. 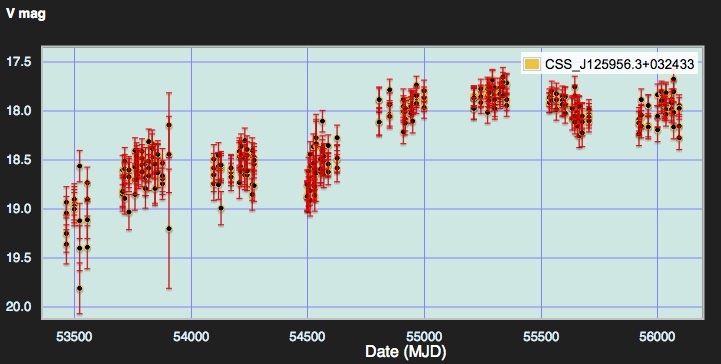 Extract photometry by Catalina db ID. Search for a period by Catalina db ID. 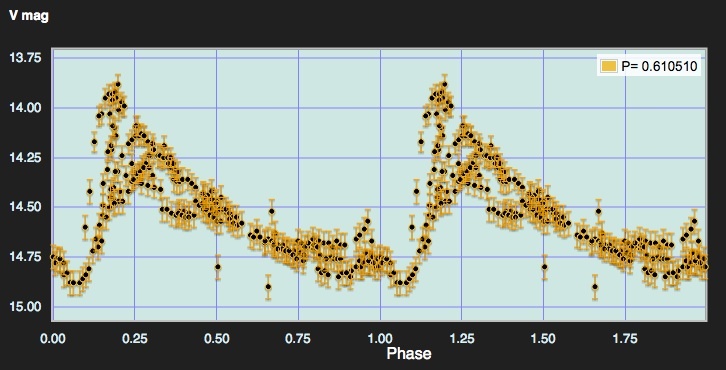 More examples of Catalina Surveys lightcurves and GCVS variables. Links to 12,000 RR Lyrae from CSDR1. If you download and make use of these data in a publication, we request that you inform us via email including the name of the journal, authors, and publication status. This will allow us to keep track of the impact of our work and also inform you of any significant changes that might effect your work. We request that you adhere to proper scientific attribution methods whenever using Catalina Surveys data. A list of the publications using Catalia Surveys data is given here.